Today’s meeting was very busy showcasing the many aspects of the Rotary Club of Castro Valley, especially Service Above Self. During lunch, members had the opportunity to view photos by Jim Negri from the Club picnic held on August 16th at Lake Chabot. Special thanks to Cliff Sherwood and Randy Vanderbilt for cooking as well as thanks to everyone who helped out in any way. If you saw a photo that you would like to have, please contact Jim. Even though Jim Negri is not a Mac user, he demonstrated the upgrades to the Rotary Club of Castro Valley website (www.castrovalleyrotary.org), which contains much valuable information about Club activities. Be sure to check out the list of upcoming speakers so you can invite a colleague. Next up on the website will be the meeting summaries. If you need your login and/or password information, please contact Jim. He also noted that important Club information is shared via email; however, only 50-60% of the members typically open an email. Be sure to check your email to Club info. 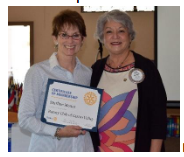 President Carol welcome Murline Monat at the newest member of the Rotary Club of Castro Valley and challenged her to bring in a new member in the next 90 days. Murline is a local real estate agent. If you haven’t had the opportunity to meet Murline, be sure to take to do so at an upcoming meeting. Remember: Ceta has challenged each of us to bring is a new member this year. Today, she introduced BART Director John McPartland, a former member of the Rotary Club of Oakland who is interested in joining Castro Valley. After hearing Obse Lubo speak about the Breathing for Life Project at its meeting, the Rotary Club of Ripon and individual members raised funds for the project. Today, six members of the Club attended to make a donation of $1,100 to the project. Thank you to the Rotary Club of Ripon for its generous donations. Mark your calendar for October 22 at Redwood Canyon of the Breathing for Life Gala. Speaker Coordinator Gary Bosley asked members to step up and volunteer to coordinate a month of speakers. He is still looking for October and January. Interesting and engaging speakers draw members to meetings and helps build membership. Contact Gary to volunteer. The Smart Consumer: A Bullet-train Presentation on Identity Theft, Credit Bureaus, Collections, Contractors and More! In a wide-ranging talk with plenty of opportunity for Q&A, Michael R. Meinert, Esq, owner of Meinert Law in Walnut Creek addressed a number of important consumer topics. He also distributed a very detailed handout explain the issues and how to handle them as a consumer. the wide-range of topics listed above. Mr. Meinert highly recommended that everyone submit an annual request for his/her free credit report as good practice to check one’s credit and to build a paper trail to address future problems. He provided members with the form to request the free report.